BTGuard is a VPN and SOCKS5 proxy service that operates as a business of Canada-based company Netcrawled LLC. The provider is well known for its strict ‘no-log’ and torrent-friendly policies, both of which have helped build it a strong reputation on the virtual private network market. BTGuard offers servers in three countries: Canada, the Netherlands and Singapore. Its website states that it operates with lines capable of 10Gb/s port speeds, with access to several tier 1 networks. Its backbone providers include Level3, Teleglobe, Deutsch Telekom, Global Crossings, NTT Communications, Tiscali, Telia and Cogent Communications. Although there are just three available locations, each of them strategically covers customers in North America, Europe, and Southeast Asia. Its Canada servers are ideal for users in the United States and Canada. 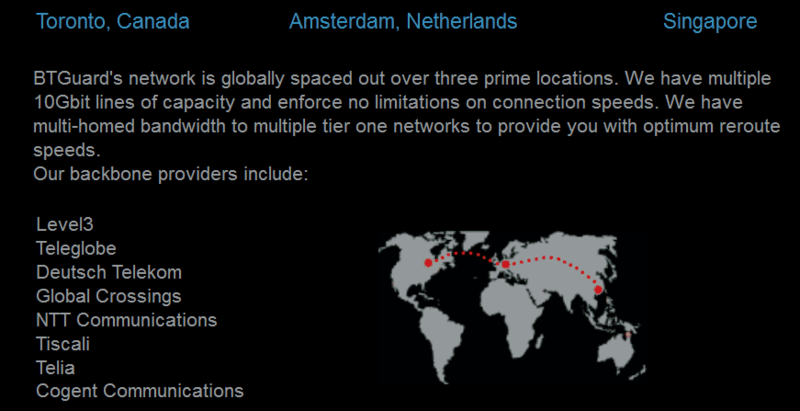 The Netherlands endpoint accommodates users throughout Europe as well as North Africa, while the Singapore server covers the surrounding locale with the inclusion of users in mainland China. The service is known for its strict ‘no-log’ policy and its positive attitude towards torrent transfers – which isn’t always observed with every VPN provider. As mentioned earlier, the company is based in Canada, where until recently, data protection laws were considerably favourable towards telecoms and internet-service firms. In the last few years, however, Canada has adopted tougher anti-piracy and data retention laws. But despite the Canadian government introducing an anti-piracy law in 2015, which forces ISPs as well as VPN companies to hand over IP addresses of users assumed to have pirated unauthorised content, BTGuard stands firm in stating that, in any instance, such legislation would never result in the compromise of user confidentiality. The company has also previously hinted that in the future, it may replace its Canada server with a different location. Likewise, it is not uncommon for VPN providers to move their HQ or registered address locations, which could be another possibility should their Canadian residency become untenable. BTGuard provides encryption over OpenVPN and PPTP protocols. OpenVPN is available with 128-bit Blowfish-CBC keys. With OpenVPN, users also have the choice to switch between UDP and TCP. Primary focus is given to UDP connections as users are able to connect over it to all BTGuard servers; while over TCP, you can only connect to the fastest available server. UDP is recommended and is used for standard VPN connections, while TCP is better recommended for use over tough firewalls in restrictive locations like Iran and China. In terms of acceptable usage policy, BTGuard allows users to connect on as many devices as necessary from a single location, which presumably is determined by IP addresses. However if one account is shared and noticed to be active from multiple locations, then the provider reserves the right to suspend the account. BTGuard does not offer its custom built applications, therefore, the most recommended way to configure BTGuard with OpenVPN is with trusted third party VPN clients such as OpenVPN GUI for Windows or Tunnelblick for Macintosh. iOS and Android users are recommended to use the OpenVPN Connect application, which can be downloaded from the App Store and Google Play respectively. To connect with PPTP, users can utilise their operating system or device’s built-in VPN client. As OpenVPN is the universally recommended encryption protocol, we will demonstrate how to set up BTGuard on a desktop machine using the open source OpenVPN client for Windows. We will also briefly show how to configure the VPN on a smartphone using the OpenVPN Connect app. Detailed instructions on doing this can be found in our OpenVPN setup tutorials for Windows and Mac. Ensure to set the client to “Run as Administrator”. This is done by right-clicking its launch button, heading to the “Compatibility” tab and toggling this option “On”. 2. Download and unzip BTGuard OpenVPN configuration files. BTGuard’s self-extracting OpenVPN configuration files will unzip its contents directly into the OpenVPN client’s folder in Program Files. What’s extremely useful about BTGuard’s self-extractor is that it extracts all of the provider’s config files right into the OpenVPN client’s folder in Program Files, essentially saving users time and effort of having to manually transfer the files. Move the cursor over the preferred server location and click “Connect”. Enter your VPN login details. 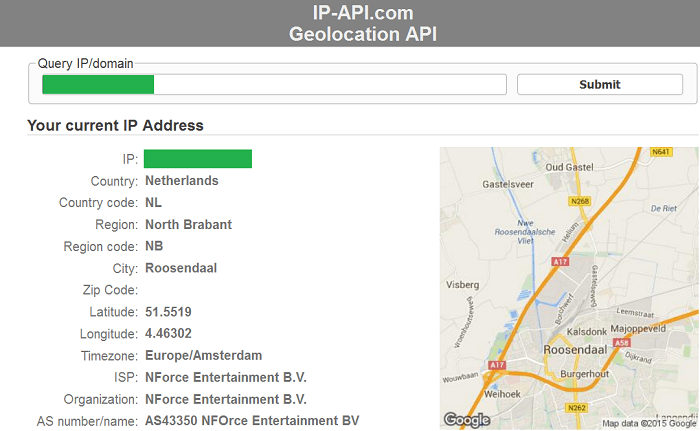 Successful connection to Netherlands node. IP check confirmed successful connection to Netherlands server. Head to the Google Play Store and download the application – OpenVPN Connect (iOS users can download the same app from the Apple Apple Store). This is the official mobile version of the OpenVPN Windows client. The OpenVPN mobile client is available for both Android and iOS devices. Firstly, download BTGuard’s OpenVPN configuration files (the same files we linked to earlier in the article). A file-unzip app, such as “RAR” for Android is also required to extract the config files from the initially compressed folder. Next, open up the OpenVPN app, choose Import from the menu and locate the config files in the folder they were downloaded/extracted to. Choose the preferred connection option and hit Select. You will now be back at the VPN login page where you will see a message confirming the successful import of the server profile. Now, enter your BTGuard username and password, then tap Connect. When the connection has successfully established, you should see a key icon in the top left corner of the screen, together with the OpenVPN icon with a small green light. Both are indicators of an active connection. As with the desktop connection earlier, it is worth running a quick IP check to ensure that your device is now accessing the web through a different IP address. We tested BTGuard’s servers from two locations: Midwestern United States and the United Kingdom. From the US, we tested using a 70Mb/s cable connection, and from the UK, we tested with a 17Mb/s ADSL connection. In addition to VPN, BTGuard offers a SOCKS5 proxy, which, when enabled, changes the IP location within specific applications. BTGuard makes particularly emphasis on the benefits of using the proxy with BitTorrent clients to change the IP location of your torrent traffic. Nevertheless, it can likewise be used with other proxy-supporting programs, including web browsers. Unlike VPN, the proxy does not implement encryption, but is still a viable option for masking your IP location. The proxy works with Windows, Macintosh and Android operating systems. Windows users can also take advantage of the uTorrent/BTGuard Easy Install, which comes with a pre-configured version of the popular torrent client. As you can see in our example above, the proxy has successfully changed our torrent IP address. Alongside the proxy, BTGuard offers an extra encryption layer, executable through MyEnTunnel. This will add SSH-based encryption on top of the IP redirection performed by the proxy. The encryption layer is useful for BTGuard proxy users who are likely to encounter deep packet inspection (DPI) and other forms of traffic throttling over their network. It isn’t, however, recommended when using the proxy for torrenting as the SSH tunnel supports TCP connections only, whereas most torrents require UDP trackers in order to work. The provider does not offer a free trial and operates with a no-refund policy, but offers both VPN and its proxy at an average market price. Therefore, if you wish to just try the service out, the one-month subscription would be best suitable. However, if you would like to take advantage of available discounts, BTGuard offers plenty with lengthier billing cycles. All evidence suggests that IP-Echelon contacted BTGuard, who sold then me out and continued to bill me regardless of my requests to cancel my subscription. Trust me, SUBSCRIBING TO BITGUARD AN INCREDIBLY BAD IDEA! I asked BTGuard to cancel my account and they wouldn’t respond for months. I ended up paying several months for a subscription I didn’t want until I realized they would not do it. So, I had to manually block the subscription from my Paypal account. If you need any support at all from BTGuard, I would highly recommend that you STAY AWAY. Just use something like rapidseedbox. BTguard not accepting Bitcoin payments any more. Have tried messaging BTguard but no responses back. BTguard gone down hill. I just purchased Btguard proxy after reading reviews on this site and other sites too on the net. The selling point was that the setup is easy because of their preconfigured utorrent download. But believe me, it is absolutely a nightmare to get Btguard to work. The preconfigured utorrent download does not work at all. I re-download and re-installed the package multiple times but simply it does not work. Then I downloaded utorrent and manually changed the connection settings in utorrent as per the Btguard support website, and behold it also does not work. Utorrent works if I do not use any proxy but then there is no use of Btguard then. The customer service is non existent in other words ZERO customer service. You are on your own. Don’t take my word but just google on the utorrent and Btguard connectivity / not working issue. I just burned my money on this crap…. Is this able to be installed on my modem router ? I want a secure VPN service on the ‘front end’ of my system, rather than on my various devices. Am I able to setup so that any torrent streaming is undetected ? I have just found out about kodi tv, and am enjoying the benefits of choosing what I want to watch, when I want to watch it. BTGuard can definitely be configured on DD-WRT or Tomato-flashed routers, which will ensure that your entire connection is encrypted, as opposed to just individual devices. For encryption, it uses 128-bit cipher, which is more than sufficient to hide torrent streaming traffic. I’ve been using BTGuard VPN for over a year and it works fine for me. I don’t browse or download anything without turning it on. I recently switched to BT GUARD and I could not be happier. It has never stopped working and as hard for it is to believe my downloads are much faster. Also, I’m not the brightest cookie in the jar yet it was the easiest download I ever did. Hi Mike, there are step-by-step instructions on manually configuring the BitTorrent proxy, they can be found in their ‘support’ section. You’ll just need to change a few connection settings and input your BTGuard proxy login in the uTorrent preferences. Regularly using Btguard proxy when downloading and it hasn’t let me down once. My speeds have reached 2Mb on a well seeded torrent and yes, always perform the torrent IP check to make sure. Btguard’s service is fantastic!1 Speeds aren’t any slower than my ISP. Now I’m d’loading as though I’m in another country. I’m using their software thats specifically designed for utorent. Don’t overlook the discounted plans, because you will not be disappointed.